026. ANTARCTIC WEATHER STATION. Issued by Shell Oil in Australia (1963). 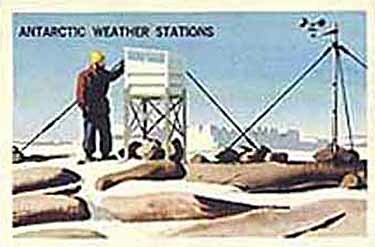 It is card number 414 from a set of 60 cards (#361-420) entitled "Meteorology Series". The front of the card shows an artist-drawn representation of an Antarctic Weather Station, while the back of the card has a descriptive text. The card was given as a free premium with purchase of petrol. Recto: View of meteorological station with various equipment and one figure. Title upper left: Antarctic Weather Station.